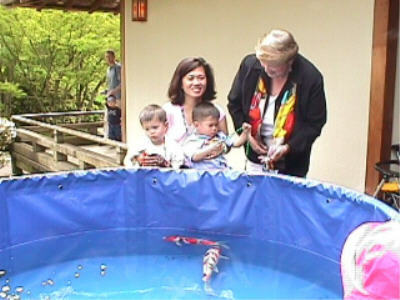 The purpose of our participation in the Uwajimaya Japanese Festival September 18-19, 2005 was to be informative to the public about the hobby of Koi keeping and, since it was a Japanese Festival, raise awareness of the contribution the Japanese have made to the Koi. We set up our display on Friday night with 2 show tanks. With the wonderful display of Water features and exotic plants provided by Hughes Water Gardens we where ready in grand style for Saturday and Sunday. As the weather cooperated this year we had a steady stream of questions to answer! We had color pages and crayons for the children provided by Judy Ramento and Elmers Pancake House in Beaverton. Ron Zitzewitz had hand stamps with Koi figures for the children. Our video of the All Japan Show was showing and created a lot of comments. Since our booth was directly across from the stage we were entertained by the various Japanese groups, this added to the overall festival atmosphere for our club display! It was a great success and without all of the members hard work the public wouldn't have had the exposure to the wonderful world of Koi. Washington Koi & Water Garden Society spent the day at the market, Redmond Farmers' Market, that is. 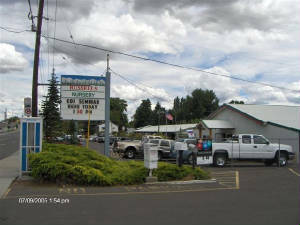 We had been invited to one of the busiest & oldest farmers' markets in the Seattle area. 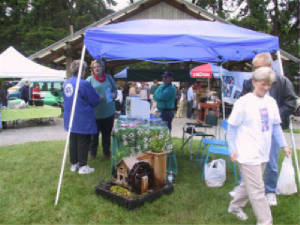 Club volunteers set up a booth on Saturday, June 11. 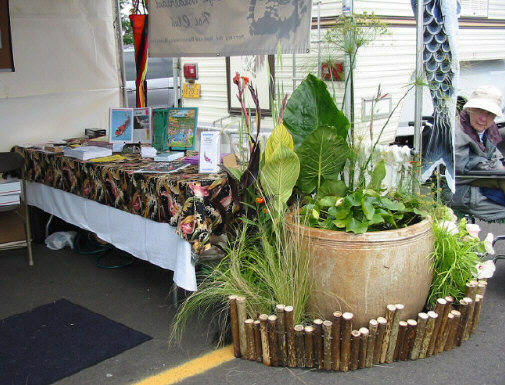 We introduced people to koi-keeping & water gardening, by using several enticing visual aids. A TV monitor ran continuous tapes of THE LIVING JEWELS. Our water feature at ground level was a kid magnet. We passed out club brochures & free back copies of KOI USA & NISHIKIGOI magazines. 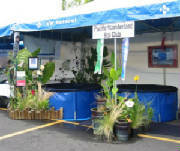 We answered many questions about koi-keeping & our club's activities. It was a fun day, in a relaxed & festive market. 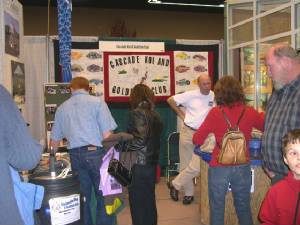 We were very pleased to share our love of koi & water gardening with so many people. Parents all over the world take great pride in their children, but each year in Japan, two separate festivals are held in their honor: March 3rd for girls and May 5th for boys. At the Japanese Garden in Portland, they combine the two days and celebrate Children’s Day. 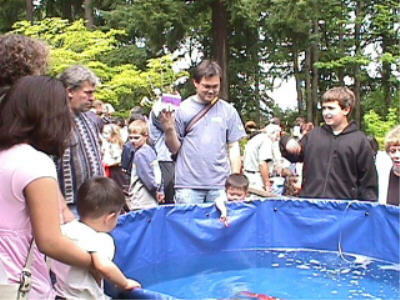 Because of this fun day, getting young children interested in becoming future koi keepers has never been a problem for members of the Northwest Koi and Goldfish Club. Since Children’s Day at the Japanese Garden is always on the first Sunday in May, we never know how the weather will be, but this year we were blessed with a really beautiful day. The day before, when we set up at tank on the east deck of the garden’s pavilion, it was raining so we were pleasantly pleased that Sunday turned out to be sunny and warm. The children swarmed around the tank to ask questions and admire the koi. Club members talked to the children and answered the many interesting questions from these inquisitive little minds; “How old are they?”, “Do they bite?”, “Do they have names?”, “What do they eat?”, “Do you eat them?”, “How big do they get?”, “How long do they live?”, “Can I pet them?”. This year we were prepared for their many questions with a pamphlet that was designed just for them and handed out. The children enjoyed so many hands-on activities at the Garden; sumi brush painting, block printing, ikebana, koi drawings, and folding origami koi provided by Northwest Koi and Goldfish Club. But of all of the activities at the Garden the children seem to enjoy visiting and sometimes petting the koi the most. However, this year it was a little sad as the children’s favorite koi, a large yamabuki ogon named Traveler, was not in the tank. Several children asked where Traveler was and it was hard to tell them that he couldn’t make it this year (the truth was that he was old and didn’t make it through the winter). They really missed his friendliness, he actually reached up to the children’s hands to be petted! We always have lots of fish stickers for the children, but this year we had a special gift for each one. On one of our shopping trips we had found some wonderful fish necklaces and they were definitely the hit of the day with both the children and the parents. We ran out before the day was over and vowed next year to have twice as many so we would not have any disappointed little faces looking up at us again next year. This beautiful Spring day was so much fun and the children’s smiles so enjoyable that the members of Northwest Koi & Goldfish Club hope to continue to help with Children’s Day at the Japanese Garden for years to come! 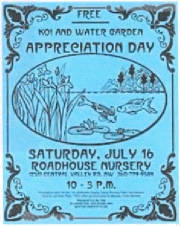 The Olympic Koi and Water Garden Club held a Koi Appreciation Day held at the Roadhouse Nursery in Silverdale to promote the hobby of Koi keeping and water gardening on July 16, 2005. Our members spoke and held sessions on Koi Identification, Pond Construction, Filters, UV lights, general electrical needs for the ponds and Care of Water Plants in our ponds. Refreshments were served and of course there was no charge to the community. Our club members had a barbecue after the event, winding up a great Day. 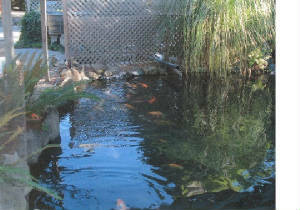 Our club also held the annual Pond Tour on August 13, 2005. There were 7 ponds on the tour with the tickets being sold for the club at the Roadhouse Nursery. As usual we charged $5.00 for adults with children under 18, free. Besides donating $500.00 to the AKCA to help with the KVA problem, our club is going to help with the expenses of our two members who are currently taking the KVA classes being held at this time. We are happy to say Lei Philbrick, and Dave Smeja are taking this class to help our members with our pets and of course, any needs with KOI health that might come up in our local community. 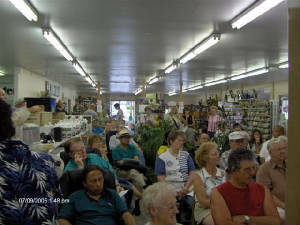 The Yakima Valley Koi and Water Garden Club hosted a free seminar on Saturday, July 9, 2005 at Russell’s Nursery in Yakima. 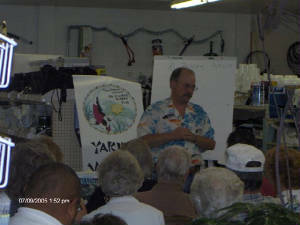 The seminar, Koi 101: Pets or Fertilizer, featured speaker Al Fearon. Al, a well versed authority on Koi, believes in the education of all Koi keepers to avoid the pitfalls of not knowing about your fish friends, other than they may have had indoor aquariums. After the seminar Al fielded questions from the 34 participants on water quality, diseases, food, filters, and much more. The club offered half-price membership and welcomed ten new members. Yard, Garden and Patio Show in Portland, Oregon. 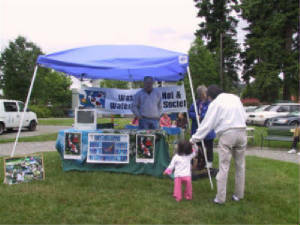 We had the Club's Koi on display, along with information for people to look at, showing them what kind of information was available through joining our Club. We used AKCA pamplets and past Cascade Club Newsletters, our Club quilt, a disasembled fillter, some media, a net, and other accessories to show the public what we used to take care of our wet pets. Pictured is member Jeff Thomas, who always is eager to help. Most of the attendees came to us with questions about predator prevention. We took turns manning the booth with energetic and outgoing Club Members, eager to answer their questions. Presenting our hobby to the public is a good way to attract new members to the Club and to the hobby of Koi and Goldfish keeping. Many thanks to our display chair, Pete Garner, for all the hours of manning the booth and his hard work setting it up and taking it down. Our booth was a big hit with the children, many of which were not too impressed with the grown-up part of the Show. We all look forward to doing the booth each year.